Today I went on a bit of Christmas card bender, trying to find some cool-looking cards that also had a bit of Indian flavor. You see, right after Thanksgiving, I had panicked -- what if you couldn't find any Christmas cards here, or if they didn't appear until just a week or two before Christmas? Luckily, December 1 or so seems to be the date that the Christmas season begins, because right around then cards started becoming available here and there. A lot of the cards I saw first just weren't that exciting -- generic pine trees, badly drawn stockings, and very fat Santas, and most of them seemed imported from the Island of Misfit Toys or something. Don't get me wrong, they weren't terrible, but it just seemed a little weird to send cards like that all the way from India. The best cards I found were at the stationery floor of Gangarams, on MG Road, and also at the Pauline Books and Media Center, on Museum Road. At Gangarams, I liked the cards that had Christmas trees and bouquets made of of pressed leaves and flowers. But the best was still ahead. The Pauline Center was a hotbed of Christmasism. There were two full tables of cards, and the sisters were even playing Silver Bells (by Nat King Cole?) on the speakers. 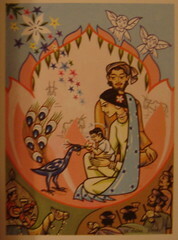 The cards I liked best here ones on handmade-looking paper with a nativity scene and a leaf pasted on the front, and some brightly colored ones showing an Indian Holy Family being greeted by a peacock. These last were made at a convent here in Bangalore. Related: How to Celebrate an Indian Christmas -- I'm guessing that the audiences is primarily non-Indians (if an Indian celebrates Christmas, isn't it by definition an Indian Christmas?). Either way, I'm certain that step 5 ("Dress in festive, traditional Indian clothing to perform Christmas music played on a stringed sitar, drums and cymbals") will not be accomplished in our house. I can, however, guarantee that Step 1 ("Light and place 'diya,' small candles, throughout your house") will, though -- we're sure to have another power cut sometime soon. Somewhat less related: Unfortunate Christmas Cards, many of which are actually super-cool. At www.christmasecheer.com you can send a personalized message or Christmas song to a loved one's phone. It is free and only takes a minute to do. So my loved one picks up the phone and hears a robot voice reading the message I wrote? I think I'll stick to cards for now, thanks. Oh snap! Just found your blog through Newley. Tis GOLD.